I went thrift store shopping the other day in search of some new projects and came up empty handed. I even went to five different thrift stores. On my way home I pass Goodwill. Being the cheapskate I am I didn’t plan on stopping in because I think their prices are too high, but having an already unsuccessful trip, I turned in. As I walked through the doors I hear that there was a 50% off sale on green tagged items today over the intercom. Score! 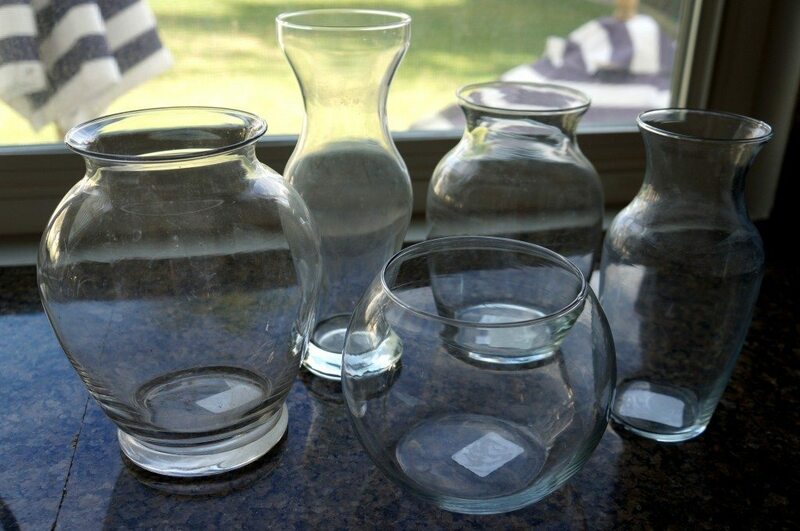 I ended up purchasing some glass vases. 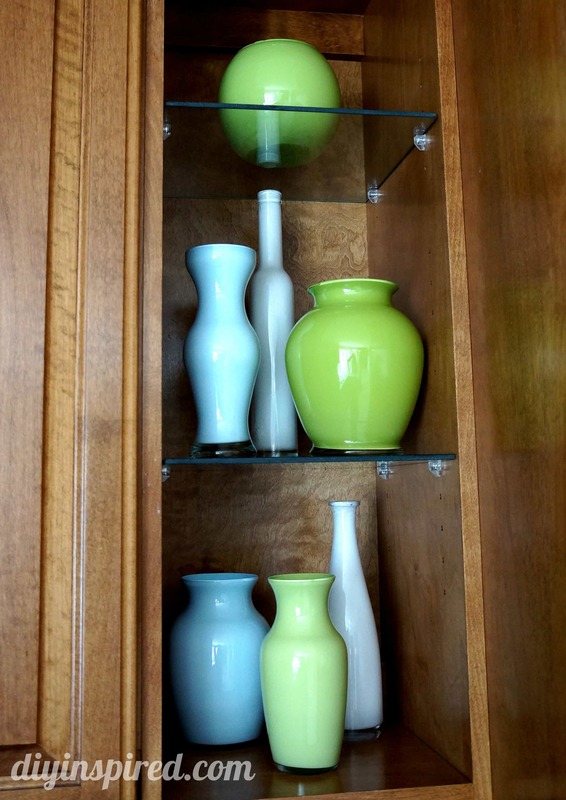 I decided that painted colored glass vases would be a nice touch as decorative accents in my kitchen. Pictured below are the glasses I purchased. I got all five of them for $6.95! When looking for glasses to paint, pay attention to the shape and texture of the glass to achieve your desired look. Take the time to make your own arrangement on the store shelf to help you decide which ones to purchase. 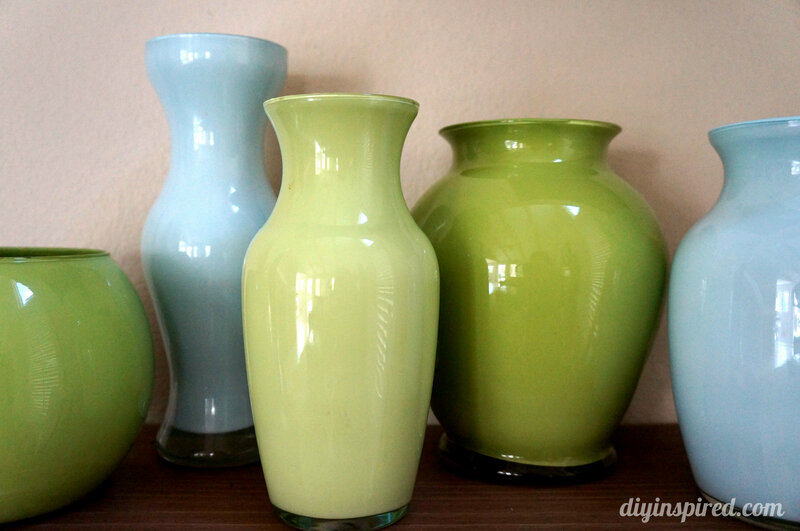 Step One: Once you have chosen your vases, clean them with soap and water and dry them thoroughly. Step Two: Apply a generous amount of paint. I mixed my paint first because I could not find the exact color I wanted. 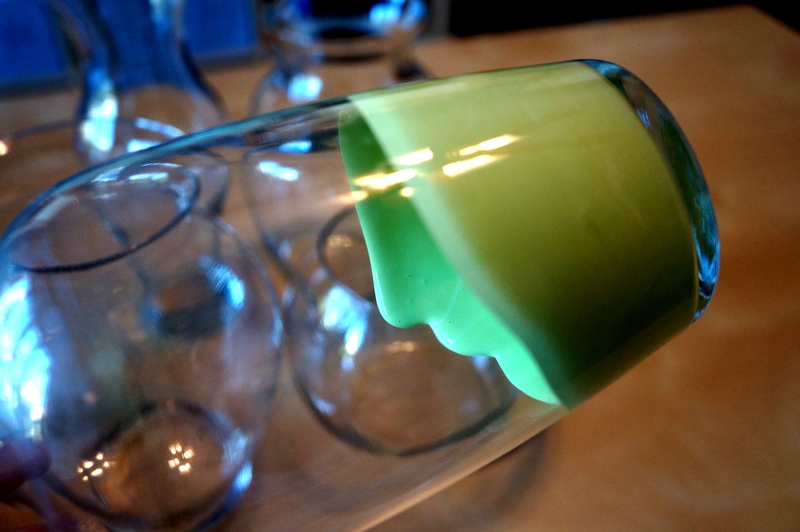 Step Three: Slowly tilt and turn the vase to cover the inside of the glass. 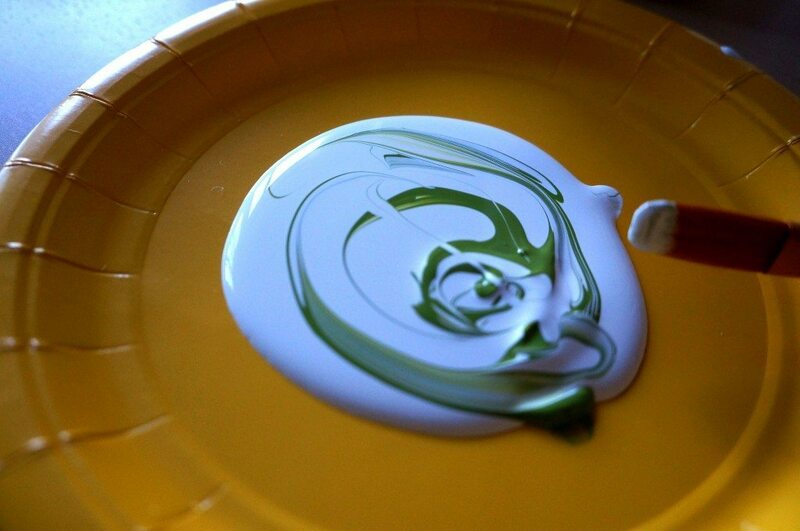 When you reach the lip of the vase, use a paint brush to neatly apply the paint and cover the entire inside of the glass. Step Four: Allow the paint to dry. Note: I use these vases for decorative purposes only. Do not fill with water or wash in the dishwasher. Was just about to say these would look lovely holding bunches of spring flowers. Then saw your note about not filling them with water. Is there a paint that would be safe to use with flowers? I’m not sure that there is! For larger mouth vases you can always place a smaller vase with water inside. For the narrow mouthed vases, small bud vases fit nicely inside. Hi Clo! That may work. Just read the back. Many are just “moisture resistant”, so I’m not sure a vase of water would last. Let me know if you try it! I would love to know. Thank you! 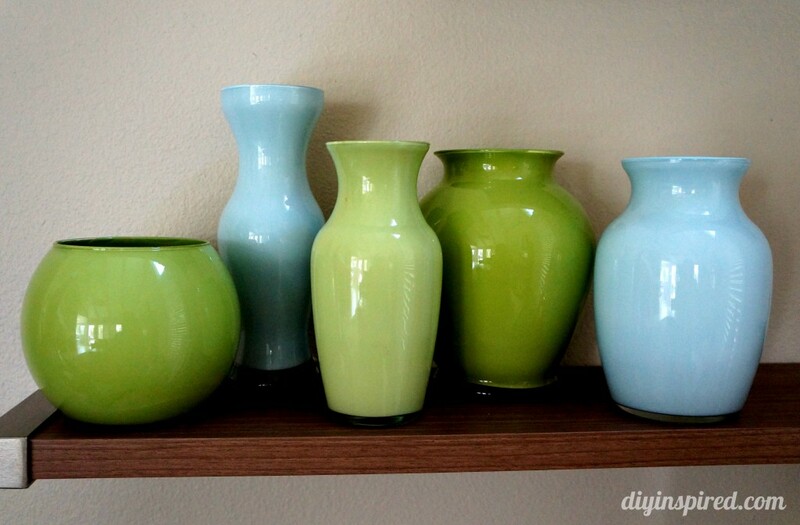 I love the combination of the colors of blue and green vases. They are cool to the eyes. These are beautiful!! I would have NEVER thought you made these from basic clear vases. These are just beautiful! Thanks for sharing the idea and tutorial! These look fabulous! I would never have known they were painted. Great job! I love that technique! And I love the colors you chose! Do you think using resin water would be OK so you could permanently set fake flowers in there? I’m not sure Mandy, but I don’t see why not! Let me know how it goes!